One of the easiest and most efficient ways to update your décor is to add or change the color of your paint, furnishings, and/or accents. The best tool for understanding color is the color wheel, which was first developed in 1878 to show how colors relate to one another. Brilliant in its simplicity, the color wheel has been the basis of color study for more than 130 years. 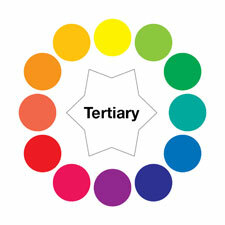 The color wheel displays the three main color families: primary, secondary, and tertiary. Primary: Blue, red, and yellow make up the primary color family. They are called such because they exist on their own, unlike the other colors, which are created by mixing two colors together. Secondary: Primary colors mixed together create secondary colors. On the color wheel, the secondary colors sit between the primary colors that make them. 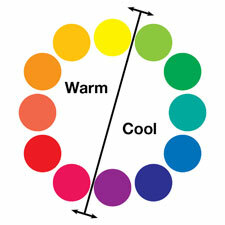 Colors that sit close to one another on the color wheel tend to convey a similar mood. Cool colors: Shades of green, blue, and light purple are considered cool colors. They create a calm, airy feeling in a room and help make a small room feel larger. Warm colors: Warm colors are shades of red, orange, and yellow. They are dynamic and energetic. They make a room feel cozy and intimate. Tip: Utilize both warm and cool colors in a room. If you decide on warm colors to dominate, balance with accents in cool colors and vice versa. Variations to the color wheel include those that show saturation and value. Saturation: Saturation refers to a color’s intensity and is determined by the amount of grey present in the color. 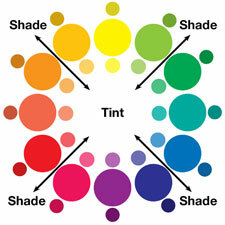 Colors with little or no gray mixed in are considered saturated. They are bright and vivid. Colors with a lot of gray mixed into them are considered less saturated. They are soft or muted. Value: Color value relates to a color’s lightness or darkness and indicates the amount of white (tint) or black (shade) present in the color. Decorating with a monochromatic color scheme can have a dramatic effect.